Above: Bob Mueller, left, and the new owner, Dean Bartu. Forty years ago Bob Mueller bought A & M, Inc., the company that has own the Exeter and now Exeter-Milligan school district busing contract. Many school districts maintain their own fleet of school buses, but since 1953, when the Exeter area schools consolidated to meet at the Exeter school, the buses have been privately owned. The Mueller’s have contemplated retirement for the last few years and this spring decided they would try to find a buyer so they could enjoy a little more free time. “After 40 years it was time to let someone else do it,” Mueller remarked. 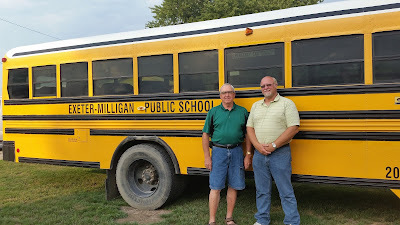 Several contract bus corporations had expressed an interest in the Exeter-Milligan contract but Mueller wanted to see someone locally take on new ownership, “I wanted it to go to someone who knew what was going on. It works so much better having someone in town own them,” explained Mueller. Mueller has seen several generations of kids through his time owning the service. In early August, Dean and Leesa Bartu purchased the corporation. 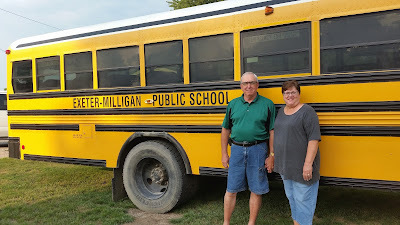 Leesa has driven bus for A & M, Inc. for nine years and Dean is working on his bus license. There have been a lot of memories for Bob and his wife, Sharon. Some of the rides that stood out the most were “all of the state championships in the different sports. Those were special bus rides home,” he mentioned. Mueller had hoped that someone who was already in the district would take over from him and was pleased to pass on the keys, “I wish good luck to the new owners,” he stated.